The rotator cuff, sometimes mistakenly called the “rotor cup,” is a group of 4 muscles in the shoulder which assists in smooth, controlled movement of the arms. The muscle group allows you to lift your arm up and freely rotate your shoulders. The tendon, attaching the rotor muscles to the bone, can tear. When it does, your normally free movement is restricted and the shoulder can become an area of pain. Rotator cuff injuries are the most common source of shoulder pain for patients over the age of 40. A rotator cuff injury can cause pain during overhead reaching. Leaning on the arm can also be painful when you are trying to sleep. Often the pain is in the shoulder or runs down the side of the arm. If non surgical treatment such as physical therapy and anti-inflammatory medicines are not effective, you may elect arthroscopic surgery. An arthroscopic rotator cuff procedure provides a more permanent solution to shoulder pain and discomfort. If untreated, tears in those muscles may worsen in time. 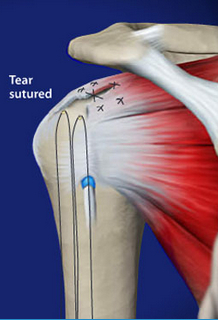 During an arthroscopic rotator cuff procedure, the muscles are viewed with a small fiber-optic device. This small camera is inserted in a tiny incision near the injury site. The tendon is re-stitched together and reattached to the upper arm bone. The recovery period following a rotator surgery will depend on the size and location of the tear and your overall health and age. 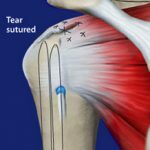 You can expect to participate in physical therapy after your procedure no matter what technique is used. Your arm muscles, weakened by the tear, will need to re-strengthen to restore previously lost movement. At Seaside Surgery Center, Dr. Steven S. Goldberg and Dr. Brian Wallace specialize in Sports Medicine and shoulder surgery. These skilled orthopedic surgeons can help you find relief from your shoulder pain.